Almonds are a rich source of Vitamin E which is a powerful antioxidant. They are also rich in monosaturated fat, one of the two "good" fats responsible for lowering "LDL cholesterol".As almonds are high in protein, around 18 percent, and contain virtually no carbohydrates, they are ideal for diabetics, pre-diabetics or anyone with blood sugar issues.Roasted almonds are a great accompaniment to tea/coffee. They go great with some cool cocktails too. * Pre heat the oven to 350F/180C. 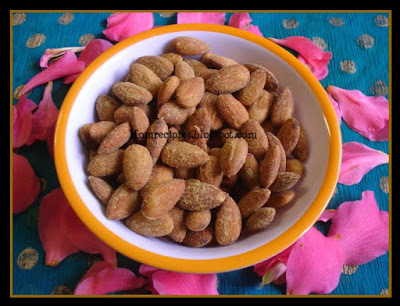 * Mix all the ingredients in a bowl , add almonds and toss until all almonds are well coated. * Spread in a single layer on a baking sheet / 13 x 9 x 2-inch baking pan. * Bake for about 10 mins. * Let it cool completely for about 15 minutes before serving. You can also add some ground pepper or paprika. Add some lemon juice for the citrus flavor. I love roastes almonds never made them home, this looks so so good. Thanks for trying carrot rice and letting me know. Lightly coat 1 cup almonds with 1 tablespoon margarine or butter(melted) and arrange in single layer ona microwave-proof plate. Microwave on high, stirring every minute (otherwise it will burn) until golden brown, 4 minutes. After cooking, try sprinkling hot almonds with a topping. ■ 1/4 tbsp Cumin Powder,1/4 tbsp Coriander powder,1/2 tbsp chaat masala,1/2 tbsp salt.Mix all this and sprinkle. Try this and let me know how it came out.